Over two weeks, cruising through northern California, writer Brooke Sauvage and I met workers from Wisconsin and workers from Thailand, Argentina, Israel; we met growers, dispensary owners, medicinal cannabis advocates, kava drinkers, conspiracy theorists, attorneys, and Native American tribal leaders. We saw giant redwoods and enormous, pungent greenhouses; we saw anxiety splashed across communities whose entire worlds were on the verge of change; we saw immense kindness from perfect strangers, who fed us, connected us, and welcomed us into their homes. Click the link above to see the piece we produced for Vice or carry on below. The West is conjured in terms at once paradisiac and post-apocalyptic; it represents both pinnacle and plummet of “America,” in myth and reality: its siren song drew gold miners across country in covered wagons just as it saw the slaughter of Native Americans. Northern California, home to the Emerald Triangle, the largest producer of cannabis in the United States, has nursed a private utopia since the ‘70s, when disillusioned hippies flocked from the Bay to the Redwoods to cultivate the herb in their own wild west. 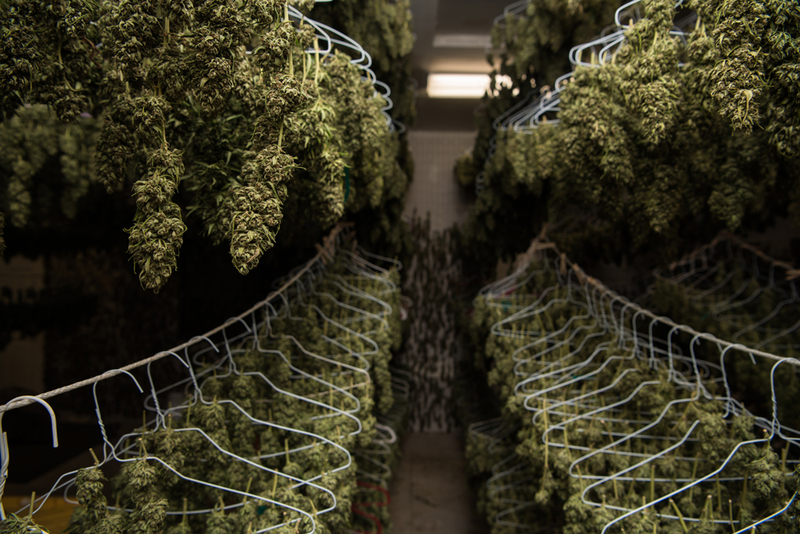 History repeats itself once again, as the Green Rush continues to seduce the farmers who grow cannabis and the trimmers who process the buds with the promise of high prices per pound. Little fiefdoms, paid for by green, pepper the hills and mountains of NorCal, where absurdities bloom with abandon: tales of police raids, buried fortunes, and bizarre disappearances waft through harvest season. With this rush coming to crescendo with Proposition 64 - the measure legalizing cannabis for recreational use in California - the market is bottoming out. Counties dangle in legislative limbo as they decide for themselves how to interpret the new state law that simultaneously contradicts federal law. With January 1 looming large in the minds of Californians, what will happen to World of Weed? “If we’re not helping to write the laws, we’re going to get written out of them,” Jonathan Collier, Executive Board Member of the Nevada County Cannabis Alliance, said. It’s widely acknowledged that legalization will mow down the mom and pop businesses that simply won’t be able to compete with large-scale operations once the door is blown off the black market - that is, unless they band together. The Nevada County Cannabis Alliance believes that small growers’ survival hinges on providing a high quality, organic product. It also hinges on the county's approving a cannabis business licensing program by March. In Nevada County, for instance, Heart and Sol Farms grows the flower that is converted into cannabis oil for Temple Extracts, which then could be sold at Elevation 2477', an aspiring destination dispensary waiting on a city permit. This collective model represents a hopeful avenue for heritage farmers who otherwise may not have such an opportunity to reach consumers. It is Collier’s hope that the “visionary mindset” of most major players in the cannabis industry will permit them to direct the funds from small collectives into progressive community initiatives, like delivering fresh food to local schools and providing for environmental remediation. You won’t see a Starbucks in Nevada City, as local ordinances won’t allow it. So too, they hope, you will never see a grower with over an acre of canopy - that isn’t their story. Legalization also hangs heavy over the fate of trimmigrants, as they’re called. Sunshine, originally from South Korea, heard about the Emerald Triangle while traveling through Europe. “I’ve met a bunch of people [that] come for the American dream. This job is a lot of cash,” she said. “Heaps of money. 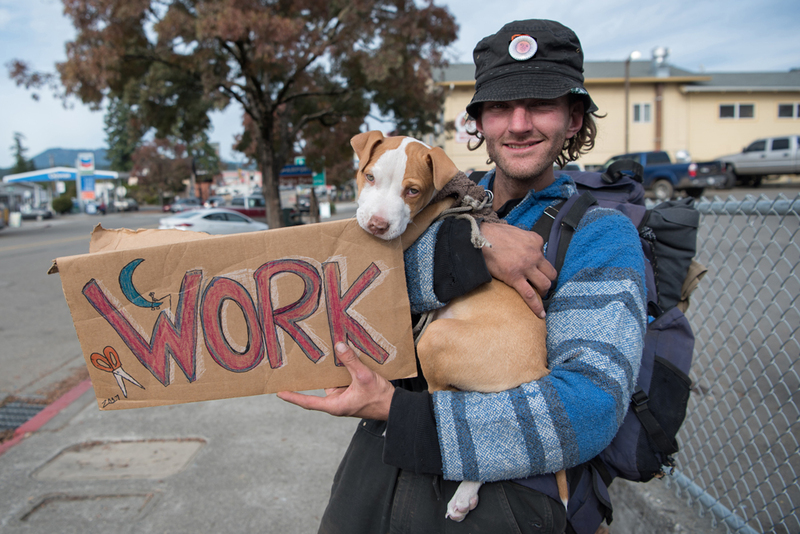 You can get as much as you work.” Jean Félix, from Montreal, thinks of it “like fishing, you’ve gotta be really zen,” he says, to find work while hanging out in the streets of Garberville, waiting for growers to come down from the mountain in pickup trucks. Trimming machines are increasingly outpacing manual workers; growers are happy to dispense with one of the highest costs in producing pounds. After legalization, California residents will have the option of working in the cannabis industry as taxed employees, but the law leaves no room for unregulated foreign workers. “After all of them are gone, I’ll still be here,” Lizzy, a native Californian, said. Emerging research indicates that strains with high concentrations of CBD, a cannabinoid with reputed healing properties, has helped people suffering from anxiety as much as it has terminally ill children. CBD doesn’t get you high like THC does, which is one of the reasons it’s popular amongst medical patients. Wade Laughter, the wizened pioneer behind Harlequin, a high-CBD strain that he identified and propagated, fought back tears with each account of the children he had helped through medicinal cannabis. He volunteers with the Caladrius Network, an organization striving to provide cannabis medicine to patients at no cost, ever. The organization arose from founder Forrest Hurd’s efforts to provide care for his son, Silas, who suffers from a rare, catastrophic form of intractable epilepsy. High-CBD strains of cannabis provided the only relief from a condition that at one point caused Silas to experience more than one thousand seizures per month. Cannabis means many things to many people: to some, it’s money; to others, it’s freedom; to others yet, it may be both. To an Argentinian trimmigrant, it might mean adventure. To heritage farmers, concerned about quality in a corporate world, cannabis could be the rock in David’s slingshot. To parents of a sick child, it might be a miracle. Whatever its significance, the industry has an opportunity to bring its vision for ethics into the world as it steps into what some estimate may be a multi-billion dollar inheritance in the regulated market. Because the Green Rush, after all, is about money. But what happens after the Green Rush will be up to the World of Weed.